What better reason to be cheerful could there be than my letter B in this challenge which takes us to the very beginning for us all, yes, that's right, babies. To hold a newborn baby in your arms is to hold hope. To think of anything other than the potential for good embodied in that baby is to give in to all that can make life so dark. I am aware that giving birth and raising babies is hard work and that some people are decidedly ambivalent about having children, but even so, my point remains, each and every baby that is born could grow up to be the most wonderful person ever. A baby, er, hatching out. 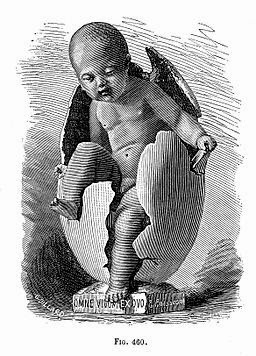 For those of you who do not already know, babies do not hatch out of eggs as the illustration above appears to suggest. Having listed babies as a reason to be cheerful, I am fully aware that some babies grow up to be wrong 'uns, ranging from people who park selfishly at the supermarket to full-blown monsters who become mass murderers. Be that as it may, without hope, without clinging on at least a little bit to the possibility of goodness in all of us we might as well throw the towel in now, and I'm not ready to do that. Today's musical offering to send you whistling on your way is Rachel Sweet singing B-A-B-Y. It's not about babies as such, but it does have the word baby in it a lot. Also it is a mighty fine single from Stiff Records, which, of course, was Ian Dury's label and he gave us Reasons To Be Cheerful. Question: Are babies bundles of joy or do you agree with writer Cyril Connolly, who said: "There is no more sombre enemy of good art than the pram in the hall." Not that I'm trying to influence you in the comments I hope you leave but...c'mon now, Cyril, lighten up a bit. * Picture of baby from Wellcome Images and used under a Creative Commons Lience. I'm glad you enjoyed the post. As a parent of four children, I learned to savour those rare moments when they were all asleep, or at least quiet. Hi Hilary, Isn't there a saying that goes something like: "It takes a whole village to raise a child"? Maybe that's where the over-doting parents get cancelled out a bit. Babies don't hatch out of eggs? You'll be telling me next that you don't find the eggs under gooseberry bushes. I know, it's extraordinary, isn't it? First time I heard the "true" facts about the birds and bees I was gobsmacked. You could be right. Maybe an A to Z of people who should put up against a wall will include these offenders, and also people who put their bag and coat on the seat next to them on the bus or train to try to keep other people away. Very bad. Great post Mark. When I hold a baby in my arms, especially a newborn, I'm just overtaken with awe. And you're right: when you're gazing upon that precious face, there is a undeniable feeling of hope and joy...and wonder. As for having babies in my own life: well, i'm more the type that prefers to hold a baby and then give it back to his/her parent when the crying starts...:) Great song selection too! Yep, do a bit of doting and then hand them back, especially if they've got a full nappy. We can only hope a baby turns out to be a good adult, although more than hope goes into it. That said, nothing felt more wonderful than holding my newborn son in my arms. Joy, pure joy. Thank you, Mark. 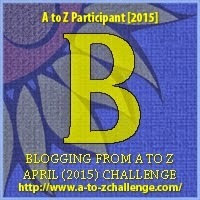 I enjoyed visiting and reading your B post. Thank you, and you're right, holding your newborn child is a most wonderful feeling. Hello Mark. Of course babies don't hatch from eggs...they're delivered by the Stork. That thing about the stork must be right because if babies hatched from eggs they'd be VERY big eggs, wouldn't they? Babies are bundles of joy. A lot of work. A lot of worry. A lot of expense. But then they grow up. And they are still a lot of work, more worry, and still expensive! W: Who ate all the pie? S: It's the bard, innit? O: "The richest gift of heaven"
D: What would I write about without this man?